Lower portion of the trail to be closed through winter, a decision regarding the upper portion of the trail is pending. 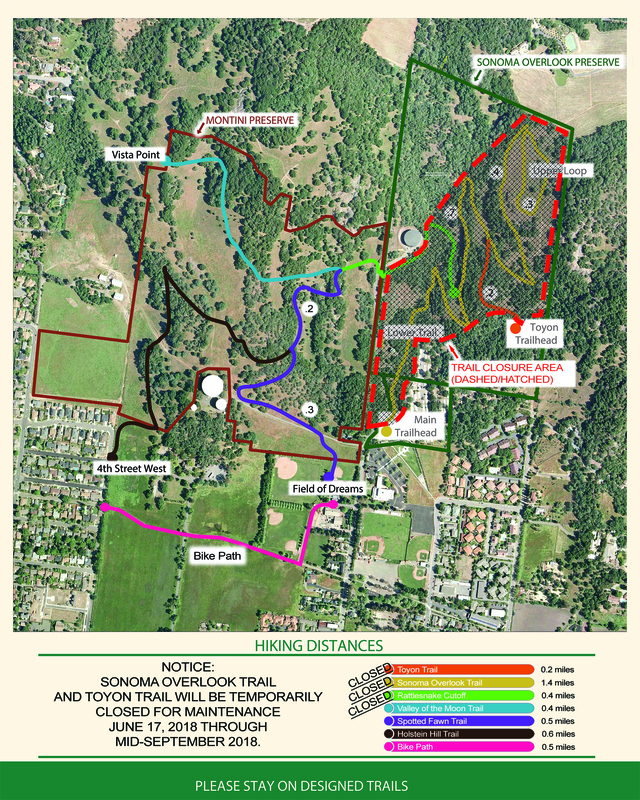 The Sonoma Overlook Trail Rehabilitation and Reroute Project (Project) opening originally scheduled for mid-September has been postponed to a date yet to be determined, to protect the community’s investment in the trail. The City, in close partnership with the Sonoma Overlook Trail Stewards (Stewards) and the Sonoma Ecology Center, started the trail maintenance and rehabilitation project on the Lower and Upper Sonoma Overlook Trail on June 17, 2018. The Project includes corrective maintenance, and in some areas, rerouted trail segments and the closure and rehabilitation of eroded areas. Consequently, the trail closure for the new reroute of the lower portion of the trail, from the kiosk to the Montini trail junction, needs to be extended until soil-moisture increases and the new trail bed achieves final compaction. This “curing” period will prevent the new trail sections from premature damage and ensure that the community receives the full benefit of the investment in the Project. 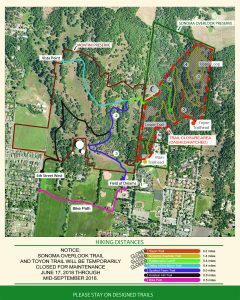 Some trail sections, including the upper portion of the trail from the Mountain Cemetery Toyon Trail to the top meadow loop, may be ready to open this fall. The extent of these areas will not be known until construction is complete. For more information about the rehabilitation project and updates on progress including photos of construction efforts, please visit www.sonomacity.org/sonoma-overlook-trail-improvement-project/ or overlookmontini.org.